What are your hobbies? And how do you get into them? I think having a hobby, something outside of your work that you enjoy doing and/or are simply just good at, is kinda important, and fulfilling. And so, I wanted to make a topic in general about what hobbies you might have and why that particular hobby appeals to you (along with some tips as to how a newcomer might be able to introduce themselves to the hobby). For myself, I have recently gotten into the Rubix Cube and have had a lot of enjoyment learning some different methods and improving the time it takes me to solve it. Started out with a non-descript cube from a supermarket and have recently purchased a GTS3M which I am enjoying a lot so far (plenty of online stores in a variety of countires that will deiver quickly and cheaply). I was able to find a plethora of tutorials on youtube (jperm and brodythecuber in particular) that I found very helpful. For any other cubers: favourite perms, methods, do you compete, tips? Something, something first post, may not be perfect, but I want to be more engaged. For almost a year now I have been playing D&D, loving every moment we get together and have a session. Because of life and stuff it's been a once a month meet up and the current campaign is coming to an end. For the better part of all that time I've sat staring at an un-painted mini, I finally took the next step and got a stater kit of paints and went at it. I wish I had done this sooner! So far they are rough as hell but honestly it's such an enjoyable little hobby. I plan on expanding my paints out to more technical washes and shades and with that buying any mini that looks fun to paint. I know a few folks play table top games. How many of you paint as well? I've been semi into this for a short while. I've done a few brews over the last year or so, three single gallon mead brews (one being a joam), one 5 gal cider brew and I've just started 3 different single gallon brews, with two being wine and one cider. From here on out I'll be starting a new batch each week to create something I really enjoy, most likely ciders. I would enjoy talking to anyone that is also interested in this subject. What's your guitar (or other instrument) practice routine? I've been a self taught guitarist for about 10 years, but it turns out I'm not a fantastic teacher, so I've been taking jazz guitar lessons this year to fill in some of the blanks. It's forced me to sit down and actually practice specific skills, rather than just noodle around, play songs I know, and not stretch myself. So I knocked together a pretty basic practice routine, and I was wondering if anyone else has a specific routine that they follow when practising? Pick a couple of jazz standards and have a play around with them. No need to get them perfect, just become comfortable looking at chord sheets and semi-sight-reading the songs. Example: I'd like to learn more about wine1, but it seems very complicated and its hard to tell what's "real" and what's just stuff people have made up to be pretentious. 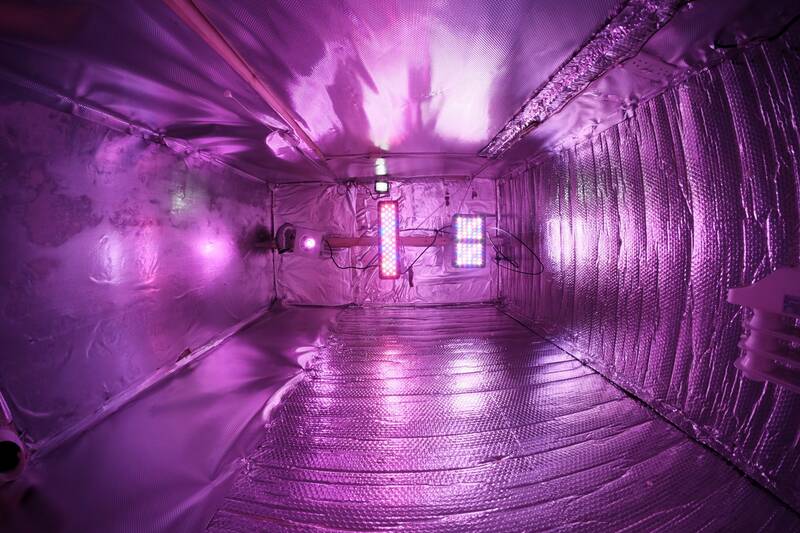 A few people have expressed interest in my indoor, semi-automated growing setup so here's the lowdown.. In a corner of my workshop is a cupboard with a footprint of 1.6x1.2m, 2.2m high. This is insulated with a mixture of glasswool, foam board and expanding foam (depending on what I could install where), and lined with diamond pattern aluminumised mylar (the diamond pattern provides diffuse reflection to avoid hotspots). Inside the cupboard I have 750W of full-spectrum LED lighting, a 500W oil-filled radiator, and a small fan to keep air moving around. There's a vent which pulls air from the outside and a extractor fan which also vents outside. Being able to pull cool air from the outside (even in summer) is extremely useful as the lights can put out quite a lot of heat. My main growsystem is an Amazon low-pressure aeroponics system, and I've also got some airpots to do some soil-based growing in. Aero on the right, pots on the left. If you're not familiar with aeroponics, it's a system where the plants roots hang in open space and nutrient-rich water is sprayed or misted over them. High-pressure aero uses mist and low pressure uses sprayers. High pressure aero is currently one of the best known ways to maximise plant growth but low-pressure is pretty good too and you don't need anywhere near as much gear like pressure vessels and solenoid and so on. I just have an aquarium pump which drives the sprayers. In my experience aero is considerably more efficient than soil, non-soil media or other hydroponics - but on the other hand it's very twitchy. If your nutrient balance is off or your pH is wrong or worse, you pump fails - things can go wrong very quickly. The airpots are totally new to me. People say they're good but I have no idea. I have a mixture of compost, perlite and coco coir to go into them so we'll see how that works out. I'm going to use organic nutrients only on them, I have some seaweed derived stuff which should be good throughout the entire grow process. On top of the cabinet is a board hosting a Raspberry Pi model A - these days I'd use a Zero W but they didn't exist when I built this. In it's mostly-bare state the board looks like this. 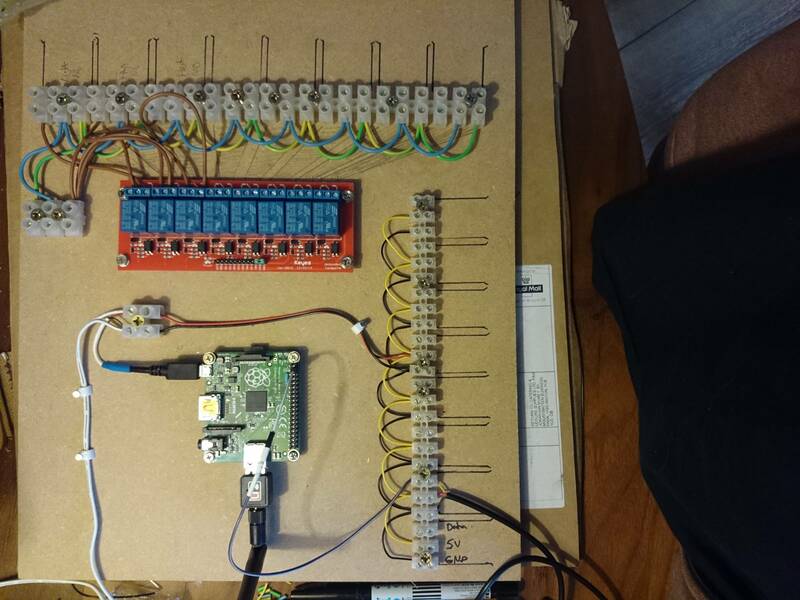 Quick explanation - the red board is mains-rated relays which let me switch the connections above it on and off using the Pi. This is where the lights, fan and heater are wired to. The small junction block left of the relays is connected to mains. The block up and left of the Pi is 5V, which drives the Pi, the relay control electronics and provides power to the junction block on the right. There are various sensors wired in to that block and connected back to the Pi. Wired up on my bench for testing it looks like this, and in situ it looks like this (this was on a previous iteration of the cupboard but it's basically the same now). The orange cables on the left are lights, fan and heater. The black cables top are the sensors. 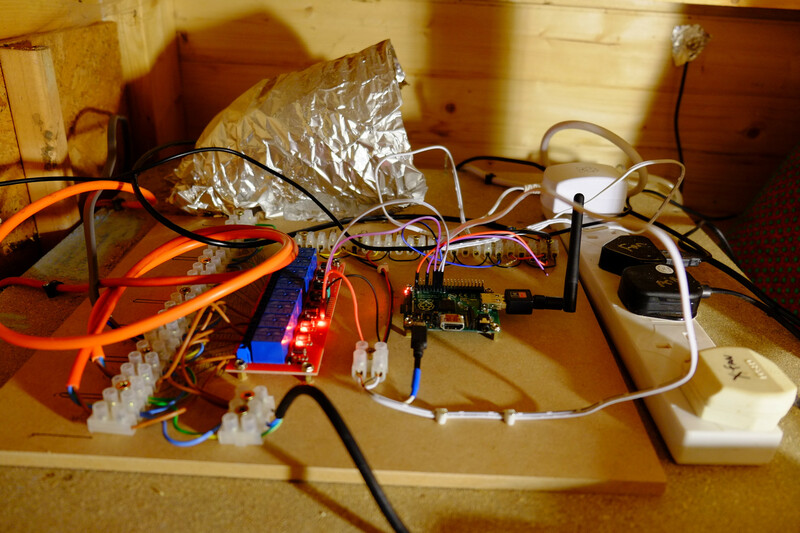 Temperature is monitored using five DS18B20 sensors, which are cheap and reasonably accurate serial devices so you can run a whole bunch of them off a single pin on the pi. I monitor my water temperature, the temperature at the plant stem, at the wall, inside my workshop (but outside the cupboard) and outside temperature. The wall/stem temperature is the important one, that determines whether heating or cooling is engaged. 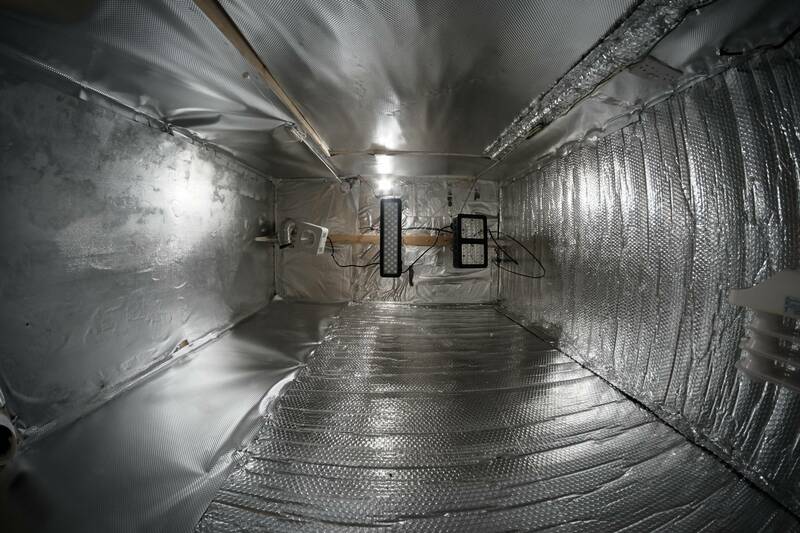 I monitor the exterior and interior temperatures to know how effective my insulation is being. If water temperature gets too high I might add an agent which protects against microbial infections that like warmer water. I do have a DHT22 humidity sensor but they're hella flaky and it's currently not working. I will replace it at some point but past experience suggests humidity is high whatever I do. The Pi has a python script which runs every five minutes. It reads all the sensors, decides what (if anything) to do, then logs everything in a sqlite database. If it's 'night' (which is actually day outside, for temperature management reasons) it turns the lights off, if it's 'day' it turns them on. If it's cold it turns the heater on, if it's hot the fan. 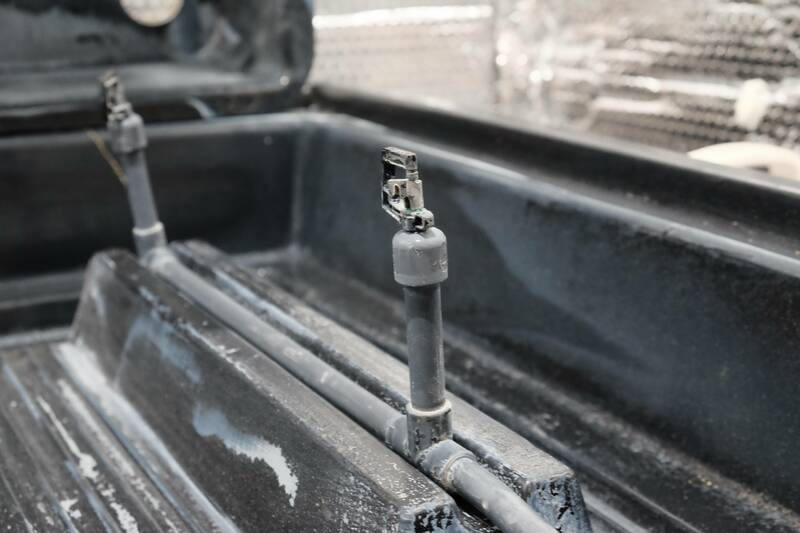 There's a bit of smartness where it actually aims for a midpoint of temperature because otherwise it's always aiming for highest temperature then immediately cooling again, then heating and so on - a stable temperature is better for the plants. 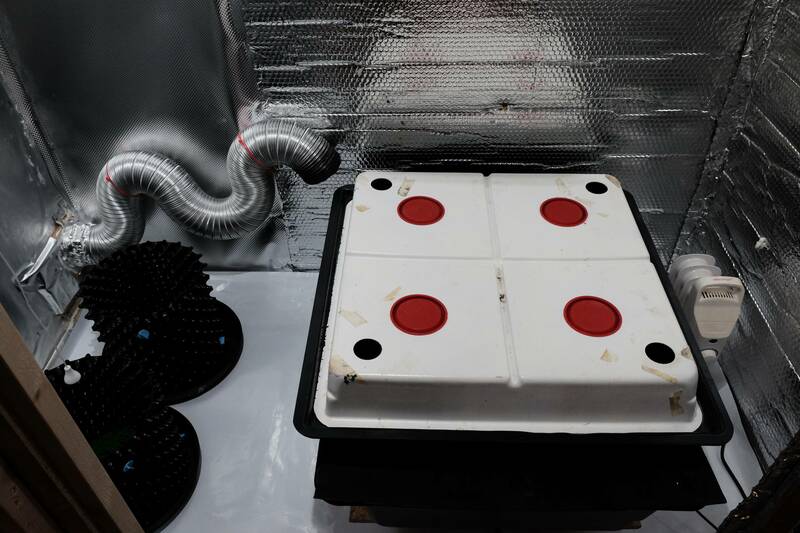 At 'night' I tend to run the fan to drop the temperature: plants often like it cooler during darkness, get some fresh air in and attempt to lower the humidity a bit. 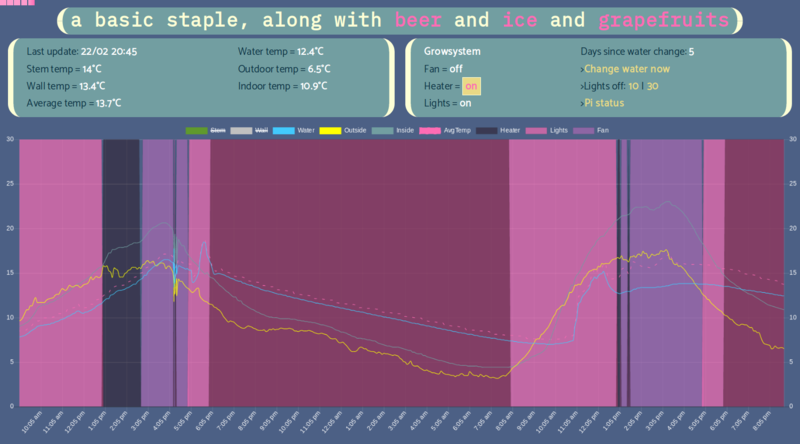 There is a web interface which lets me see what's going on - current temperature and status, plus some lovely lovely charts (who doesn't love a nice chart?). I can also turn the lights out from here in case I need to go in an do some maintenance for anything. 750W of LED light is painfully bright, it's much more comfortable (and safer!) to turn them off while topping up reservoirs or changing water or whatever. 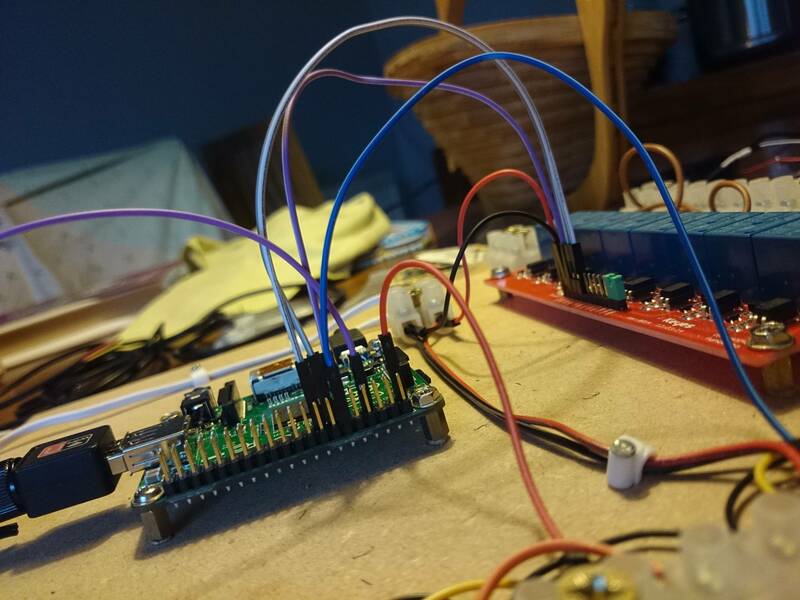 It would be relatively trivial to add sensors for moisture or pH to add an auto-watering or auto-adjusting nutrient systems, but I haven't felt the need to do that yet. Happy to do my best to answer any questions anyone has. What is a hobby that none of your friends understand? What are some interesting hobbies you can start for free and without leaving your home? I'm looking for some good ideas for some hobbies to start. Bonus points if you can come up with anything that doesn't require the internet. Does anyone else here participate in powerlifting, weightlifting, strongman, or some other fun strength sport? I've enjoyed the challenges of gardening in zone 5 -6 and zone 10 - 11, and am wondering about others' experience. Climate change, with migrating pests/diseases and more erratic weather, are definitely noticeable trends. While it's interesting to grow ornamentals and food crops that wouldn't ordinarily be available, it's also disturbing to find falling yields and utter collapses of formerly successful "easy" plants like basil and temperate climate tomato varieties. There are limits on how much can be accomplished with purely "organic" controls - I've had to experiment with soil ecology (MycoStop for fungal infections, etc.). Allergenic plants are an increasing problem. There are brand new animal pests where I live as well - iguanas, pythons, and other hot-climate reptiles. I'm curious about others' gardening results, and suggestions for improving adaptability. I built a basic panel out of some boards left over from another project. I'd like to use this as a desktop surface just laid on top of some filing cabinets. I'm wondering what the best way to finish this would be? I don't think I want to paint and I'm ok with some light staining but I don't have any experience with sealing or whatever I would want to do to help preserve the surface. It would have typical office items on it (keyboard, mouse, monitor, paper, pens, etc.). Are there any cyclists here? I wouldn't really consider it a hobby, but couldn't think of where else to try and have this discussion. How many of you have ever heard of, or even considered the idea of alternative keyboard layouts!? As unanimous as it is, why are the letters of the alphabet even placed that way on our keyboards anyway? Alternative keyboard layouts attempt to optimize the layout by placing letters in such a way as to make typing more ergonomic. Often ideas include focusing on the home row, rolling fingers, alternating hands, high frequency letters on index and middle etc. Dvorak, the most well known alternative keyboard layout. Prioritizes alternating hands by separating vowels and consonants by hand. Colemak. As opposed to Dvorak, prioritizes rolling the fingers rather than alternating hands and attempts to limit same-finger bigrams. BÉPO, a layout optimized for the French language! So what do you think? Supposed ergonomics vs standardization. Would you ever consider switching or do you think it's a bunch of hocus pocus? Perhaps you have switched or tried to switch and would like to share your experience. I am currently trying to learn how to fix things myself by learning how to solder and fix things like that. I also want to DIY some things for quite some time. My current project is working through the book Make:Electronics , I bought it at humblebundle some years ago. Yesterday I powered a led via a power outlet for the first time, by connecting it to a cut off USB cable. I'll share a picture of the abomination later. So: what have you built at home? What are you building? What are you planning to build? I would like to get into drones, any tips? I bought one of those cheap miniature drones that are flimsy but overall pretty fun to start with. Now, I have the bug to get something with a camera, more flight time, and can withstand the wind. Any suggestions on what I could get <$150 that would be a good investment. Any maintenance tips or flying in public tips? Are there any anglers on Tildes? What are your best tips for catching the big one? From my experience, the Acme Kastmaster in blue/silver, 1/4 oz is a reliable lure for fishing most lakes. Would love to hear more tips! What's an easy to get in to hobby? Hi. I recently realised that I don't do much is a sense that I only do two or three things all the time while on my free time, and those are usualy just watching youtube or browsing interenet in general. I am the kind of person that finds anything interesting when I start, but I usually drop it if there is a learning curve right at the start (eg. lockpicking). So any of you have sort of a hobby that would suite me? So, I am far from the most experienced, or the most knowledgeable, or the most active amateur radio operator out there, but it is something that has piqued my interest none the less. Before I got into the hobby, I always assumed that the FCC just game amateurs a small bucket of useless spectrum and that was it. Maybe you could fly an RC plane, but surely that is about as cool as it gets. It turns out I was dead wrong. Amateurs are allocated bands all across the RF spectrum - more or less. Bands from way below the AM broadcast frequency to way above the microwave frequencies used by our cell phones and wireless routers. Also, you are allowed to legally transmit at up to 1.5 kilowatts of power! That's 3,000 times as much power as your average walkie talkie! :) Also, importantly, the license exam only costs $15. At many of the lower frequencies, the signals bounce off the ionosphere and you can make contact with people all over the world (propagation gods permitting). At the higher frequencies, you lose that "skip propagation," but more bandwidth is available. There are analog voice repeater networks, digital packet networks, mesh networks running on modified commercial WiFi gear, and even a handful of old school packet BBSes. There are some LEO satellites which run voice repeaters which allow you make international contacts, and sometimes even the International Space Station will participate in events. Lots of cool stuff going on. This hobby is kind of a bottomless rabbit hole of possibilities. I got my technician license about a year ago, and I have been most interested in the data networking end of the hobby. Despite being a pile of hacks, APRS is still very cool, and sometime soon I hope to set up an AREDN node of my own. Every once in a while I'll call into the local repeaters and shoot the breeze. So there's my story. Are there any other hams out there? Have any hobbies that are hard to admit? I recently got into lock picking as a hobby. It's really fun and the community is very kind and open and supportive. But it's a hobby I'm hesitant to share with others. There's a huge stigma with lockpicking and I feel I have to be careful who I tell. Do any of you have hobbies that you don't share with others? Is anyone here into vexillology? Vexillology is the study of the history, symbolism and usage of flags (...) What are your favourite flags? Countries, regions, cultures, organisations, anything goes. For about a year I have been trying to work out how to make music. I want to make stuff like the OP-1 videos on Red means recording. I have a midi keyboard and LMMS on my desktop but I just can't work out how to do anything. Does anyone have any tips or resources? Everything I have found has been so specific to a certain tool that I can't use it or so theoretical I don't understand what to do with it. Built a 60% mechanical keyboard! Just wondering if people here like whisky/ey. I recently discovered that I actually enjoy Irish whiskey more than scotch even. What are your favorites? Do you like all kinds or just a kind in particular? Favorite brands there? Any particular whisky you've tried that is not common and you'd like to recommend? Microdistilleries that you really like? 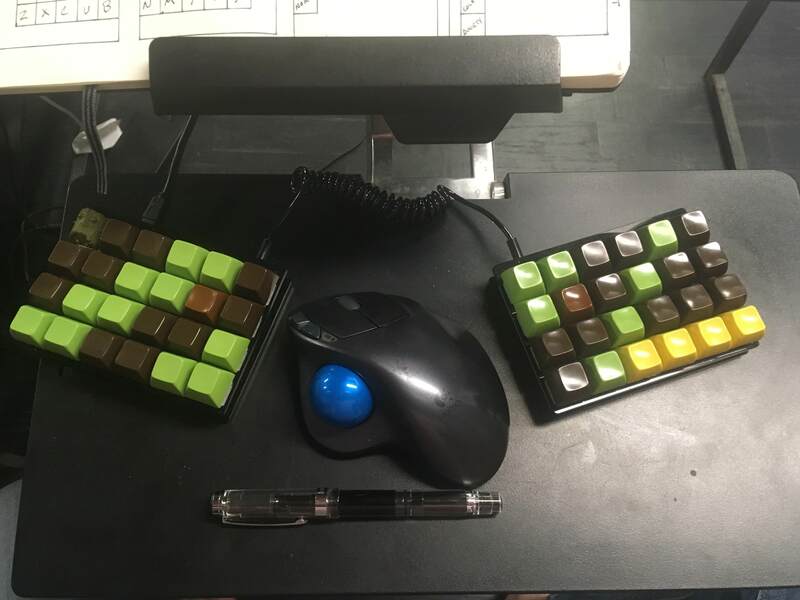 I just got my /dev/tty blanks in from Massdrop and I an thinking of dying them to match my current ABS colorway. I have looked at the guide and I think I am able to do all that, but I am wondering what kind of look I am going to/can get by dying the gray and red caps? Any hints on dying the colored caps or dying PBT in general are appreciated. Aquarium/Fish enthusiasts, what are you up to? Anybody here who keeps fish of any kind in aquariums of any kind (ostensibly of correct size) how's that going? Anything you're waiting for? Just finished a tank? Let's talk fish here! What're you drinking this week? I am interested in what you're drinking this week. I've discovered a fascination for Whiskey. I've been drinking an odd collection of Whiskey drinks, a couple of Scotch's (Glenfiddich, Monkey Shoulder) and some cheap Bourbon (Evan Williams, Ezra Brooks). I tried Irish (Jameson, Tulamore dew) too, but I can't get into it. Not all this week, obviously. This week it's been pretty much just Ezra Brooks. It's pretty good for a cheap Bourbon. Pretty heavy Oak flavor that I quite enjoy, not much complexity, but you know. It was 20 bucks. Are there any fellow Alcohol hobbyists? What're you into this week? Any quilters in the house? Or needlecrafters? I'm always looking for other folks who share my interests! Discussing hobbies - what are you into?